E.A. Chase is among the early contemporary American blacksmiths to use mixed metals as well as wood, stone and plastics in his sculptural and architectural commissions. This innovation produced dramatic affects with the contrasting uses of copper, bronze, brass, and stainless steel with iron. 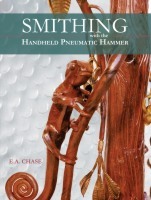 Complementary to his use of mixed metals, another innovation and the subject of this book, is his use of the handheld pneumatic hammer. Chase began using the pneumatic hammer during the early 1970s for the conventional tasks of riveting and light cutting operations. As he became more familiar with the characteristics of the tool he realized that its unique features could be advantageous in other applications, particularly to reduce the tedium of tasks requiring repetitive blows such as texturing and peening and later to its more ambitious use to construct large scale raised metal work. "New techniques inevitably produce not only different results; their influence will also be apparent in how the work is conceived and rendered. The process in getting your envisioned form can be quite different from the traditional hand process. The pneumatic hammer does not mimic the hand hammer; it has its own "personality" and makes its own accommodations and demands on the smith." So he began a decades long project to document the use of pneumatic hammers and to share this knowledge with the community of smiths. Learn to use the smaller handheld pneumatic hammers on "hot iron" days for cold center punching and line tracing for layout, hot carving and incising, slitting, cutting, peening, and riveting. On "cold working" days these pneumatic hammers are used for forming everything from delicate floral details to large-scale objects in non-ferrous sheet metals. The heavier and more powerful handheld hammers are used almost entirely for hot work such as punching, drifting, cutting and upsetting where the stationary power hammer is inappropriate or where a hand hammer would be a less efficient choice. All of these tools are supported by an array of specialty forged hammer bits that have evolved on an "as needed" basis. Learn from Chase who for over 40 years has devoted all of his creative energy to metalsmithing. This is a must have for all smiths - blacksmiths, metalsmiths, whitesmiths, coppersmiths, tinsmiths - to help create small scale hand projects or large sculptural and architectural commissions.